Alexander Artsybashev, who has been coaching the Indian race walk team since 2011, charts the country’s roadmap to Olympic glory. Indian race walkers have already made their presence felt at the Asian level. 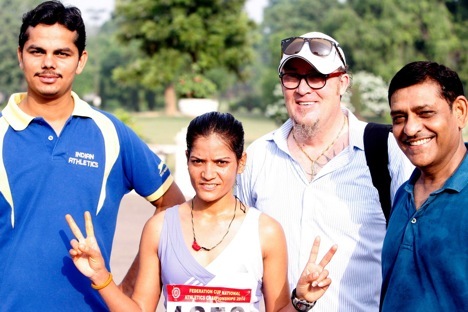 Gurmeet Singh and Khushbir Kaur won bronze medals in the 20km men’s and women’s events respectively at the Asian Race Walking Championship in March this year. “Khushbir Kaur’s bronze was a high point for me. She was leading for the first 14kms. She gave a fright to better seeded competitors,” Artsybashev says that “he cherishes all the milestones” his protégés achieve. In May, at the World Race Walking Cup, Khushbir Kaur beat her own national record; Sandeep Kumar set a new national record in 50km walk; and two more walkers, Manish Singh Rawat and Surinder Singh, notched up their personal bests. While Russians went on a rampage, sweeping top four honours and the team title in 50km walk, the Indians attained seventh spot in the team event. These are encouraging figures in the run-up to the Asian Games next month. “It’s definitely a positive trend that we are regularly updating national and personal records. I am particularly hopeful from the season leaders to carry their good form into the Asian Games,” Artsybashev says. A lot of talent comes from rural regions of the country and it is only in the national camps that they begin using English. The coach addresses such communication gaps by utilizing sports psychology. “I believe that there should be a strong emotional connect between the coach and the athletes. As in any form of learning, the trainer and the trainee must’ve absolute belief in each other,” Artsybashev says. “Sportspersons can be like children, sometimes naïve and at other times cunning. But they are all good at heart and have a strong value system. The Indian tradition of respecting elders is one of their strengths.” Some of the athletes however prefer to train with Indian coaches.